The Idol. In the flashback, Reiter leads Ollie and Taiana into a cave with a idol in it. No joke. There, Reiter just kills one of the slaves, and we watch his soul go into the idol. Also, Reiter has one of mystical tattoos that Ollie has, which is odd. Taiana and Ollie break out and make a run for it with the idol, only to find the idol can’t be destroyed, and the tunnel they go in is a dead end. So like it or not, someone’s got to face Reiter to escape, stolen guard guns or no. The People vs. Damien Darhk. So its a big court day in that Damien Darhk is facing a preliminary hearing on his charges. His attorney claims Darhk’s a different guy (and a citizen of Moldovia to boot!) and that there’s no proof of him being who he is. So Laurel (just to remind you, she’s still an assistant DA) is left to produce her evidence for this hearing, or he’ll be released from temporary custody. Well, with plenty of witnesses, this seems like a slam dunk, yeah? At Ollie’s flat, Felicity is having her things packed with an weird kind of happiness as Ollie shows up. Before he can say to her weird behavior, “would you like some lemon juice to squeeze into that open wound you left in my heart”, he is just okay with seeing her back on her feet again. Then she asks about going back to work with the team later tonight, and its awkward for Ollie, who is saying he’s cool with working with her even though they aren’t a couple. Later of course, we learn who really is having a problem with being with Team Arrow. That Awkward Team Moment. The Team arrives at the HQ, and its clear to everyone that isn’t Ollie and Felicity that they both are walking on eggshells. And while reviewing the Darhk case, realize evidence and testimony is only them and people who are still declared dead (Diggle’s bro). It isn’t long before Quentin calls to let Ollie know about a bizarre scene: a murdered celebrity couple, set up to look like a heart. That and the arrow wounds to them confirm what we’ve seen earlier: crazy girl Cupid is back, and she’s a little bitter about love. It seems she got out of ARGUS custody, and is gunning for couples. The next day, Diggle is getting questioned about the abduction by Darhk on the witness stand, and by mentioning that undercover job where he bought Thea cocaine, his credibility is suspect. In a meeting afterwards, Quentin suggests there is one foolproof way to hold the charges: he testify against Darhk. Laurel knows if her dad does that, he’s likely destroying his career, but that’s put on the backburner because Felicity has discovered another celebrity couple has been picked up by Cupid. Also, that banter between Ollie and Felicity is really icy, huh? Cupid is driving the unlucky celeb couple’s wedding limo as Ollie, Diggle, and Thea chase her. They get separated and Ollie knocks out the limo, finding the very much alive couple still inside. Cupid drops in, after ditching the limo earlier, and fights with the guy she clearly doesn’t recognize as the Arrow (you know, that guy she was obsessed with). She escapes, but loses a nap sack she’s carrying, so, good news? Love Is An Arrow To The Heart. So its obvious Cupid’s gone from being all about love to all about killing it, and at the HQ, question why. Well, Felicity in a reflection that sounds like she’s talking about herself more than Cupid, thinks she’s been hurt and is lashing out as a result. Everyone leaves Felicity be to analyze the napsack alone, and Thea and Diggle take Ollie aside to ask what he plans to do about this, as they are a bit more understanding about him lying about a secret son than Felicity seems to be. So tell her you still care, they say, but give her some time to slow her roll. Meanwhile, Laurel is looking through the Darhk file when Quentin throws out he’s willing to burn himself to bring Darhk to trial. Laurel reluctantly agrees, but tells him to be clear why he did this: to protect her. And he says it will let them know how much he loves his daughter, and jeez, I got the sniffles. Tough Calls. The next day in court, Quentin confesses to what he did for Darhk and why he did it. And despite Darhk’s attorney trying to poke holes in Quentin’s testimony, he holds the line and good for him. The rest of the team follows Felicity’s exam of the napsack to a wedding supply center where Cupid has made her home. There they find her special shrine of celeb couples throughout the city, and one that is marked off her kill list: Ollie and Felicity. Back at the HQ, the Team talks about staking out the remaining couples, but Ollie has a better idea: set up a trap to lure her in. The bait is a “wedding”…of him and Felicity! Um, she thinks that’s a bad idea, and eventually is grudgingly sold on this plan. Also, Ollie didn’t get around to cancel the wedding venue, so hey, one less thing to put together! Let’s Play “Wedding”. Thea and Diggle are waiting in hiding at the venue, as Ollie and Felicity are arriving for their “wedding”. Besides the paparazzi arriving to try and crash this “secret ceremony” (just like the Team wanted), everything is going okay, excluding Felicity’s rather terse “wedding vows”. And for Ollie, he is actually not pouring his way through this and telling her how he really feels about her. And then Cupid shows up to shoot Ollie in the chest with an arrow, and threaten to blow the venue up! 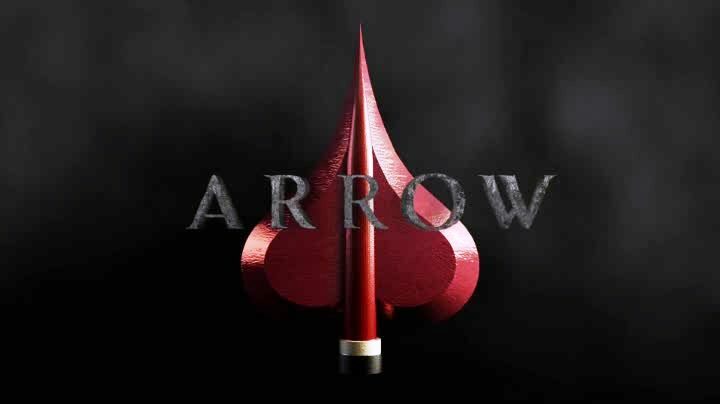 Its here we discover that Cupid is herself hurting from losing the two people she truly loved: the Arrow and Deadshot. 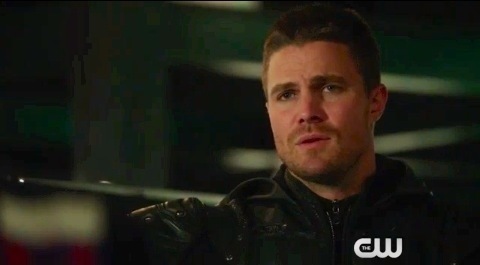 It’s then we learn Ollie was wearing a Kevlar vest which saves his life, and Felicity keeps Cupid from detonating the explosives in the building by telling her about how love has changed her into a far better person than she ever thought she be. As that seems to reach Cupid in a emotional way, she’s knocked out by Diggle and Thea. Cupid is taken away by the cops, and the group hears that the judge in the Darhk preliminary hearing is making a decision on the case shortly. Night of Judgments. At the courthouse, the judge is swayed by Quentin’s testimony, and orders Darhk held for trial. As Laurel and Quentin are talking afterwards, old buddy Detective Pike (who seriously, I thought was dead) arrives to collect Quentin’s badge and gun, and lets the captain know he’ll have to be suspended from duty and face an Internal Affairs hearing. But hey, Quentin is all good with that. At the HQ, Felicity stumbles in to see Ollie just winding down after a long day. They talk about what they said about each other during that fake wedding, and know its true. But Felicity knows there will always be that loner part of Ollie that won’t always be honest with her, and decides to just leave the Team. WHA?! Sigh, you know what? Fine. Meanwhile, Darhk is getting set up in his jail cell, and he somehow has hidden his wedding ring in his mouth and puts it back on his hand. Then he chuckles, and…I guess that’s supposed to worry us? Okay, whatever. –Comic book connections: Ollie in the DCU got married once (to the Black Canary), but that was a dicey union, as are many under mind control. No need to dwell on that. –“Ollicity” is a thing used to describe that couple in the world of the show now! –So the Team is keeping the remains of Darhk’s idol for sentimental reasons? –I’m glad someone pointed out how weird it is for Diggle to have remained a “bodyguard” for Ollie even during that time he was broke. It is weird if you didn’t know what they were up to at night. –Thea’s usage of celebrity couple names was a fun running gag, like “Allibert” and “Blannon”. ← Here comes… DAREDEVIL, the 2nd Season Review Without Fear!